I’ve been pretty busy lately in the creating department. 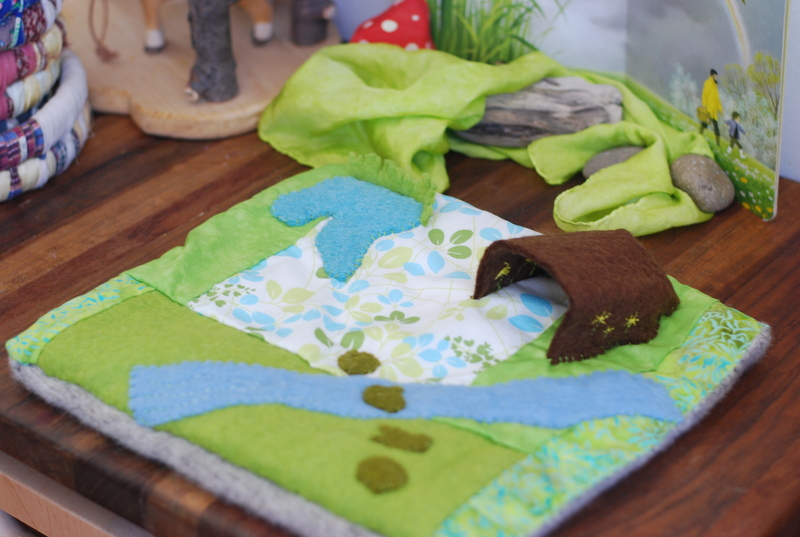 After making Ellie a seasonal spring time play mat, I realized I could be making them for every season and could possibly make them for other people too. I’ve always wanted to open an etsy shop. And since I’ve started painting and doing more crafting, I’ve been working hard to get my own little shop, up and running. It would be so nice to be able to keep making things for Ellie and others and the bit of money I would get by selling online would help make that possible. So, here I go. I opened my very own etsy shop. 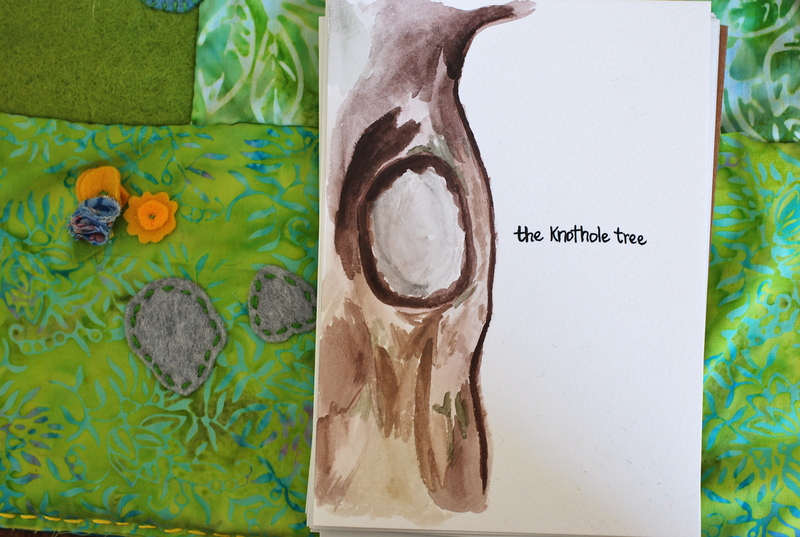 It’s called The KNOTHOLE TREE. I loved the idea of The Knothole and Boo Radley’s gifts to the children in To Kill A Mockingbird. Ellie’s middle name is Harper, after Harper Lee. I thought it was a perfect little name for a whimsical little shop. I just finished three play mats. A spring inspired one and two “Frozen-inspired” mats (because like everyone else in the world, we’ve been bitten by the Frozen bug and I thought some open-ended play mats with hand painted peg people might just be a fun idea). Here is the spring mat. 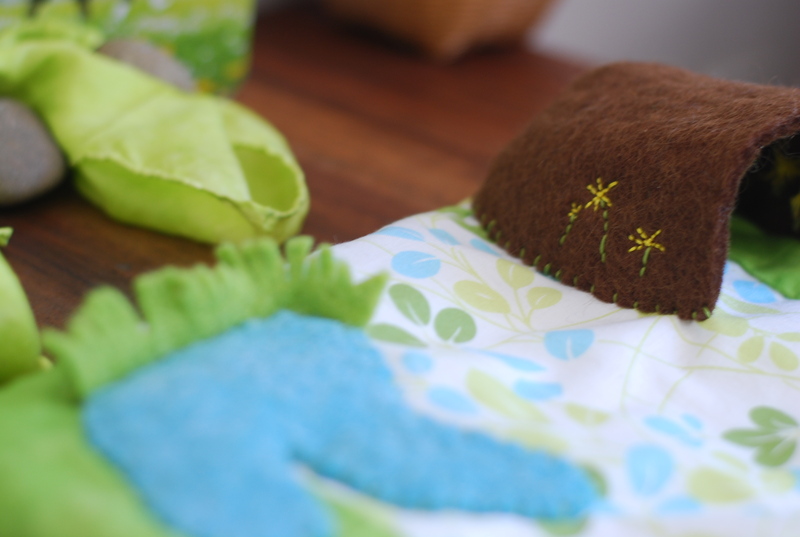 It’s completely hand-sewn and I try to use up-cycled fabrics as well as new cotton and wool felt. This one has batting in the middle and then completed with an up-cycled wool sweater. It was so fun to make. And nice to know I was giving the old sweater a new life. 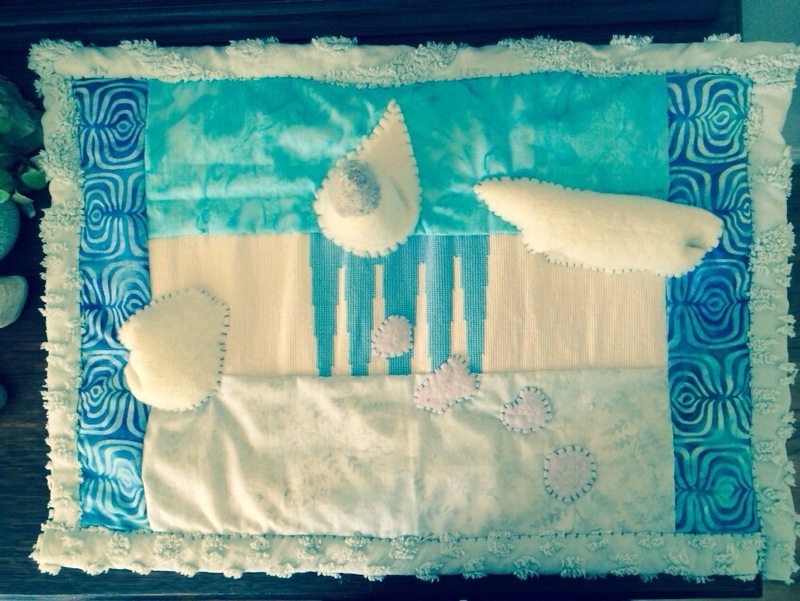 And here is one of the Frozen-inspired mats I made (that definitely could double as a winter seasonal mat or even a polar play mat. 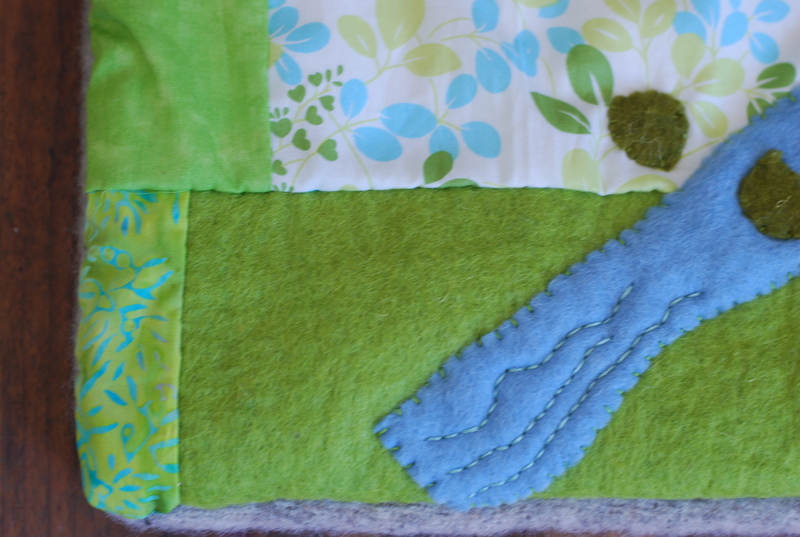 It’s also completely hand-sewn and is backed with an up-cycled chenille blanket. I love those up-cycled fabrics. The dolls were hand painted by me and have been so much fun to make. I’m still figuring out the whole peg doll process, but it has been a joy to play around with these little guys and Ellie is having so much fun picking out which ones she wants as part of her collection. 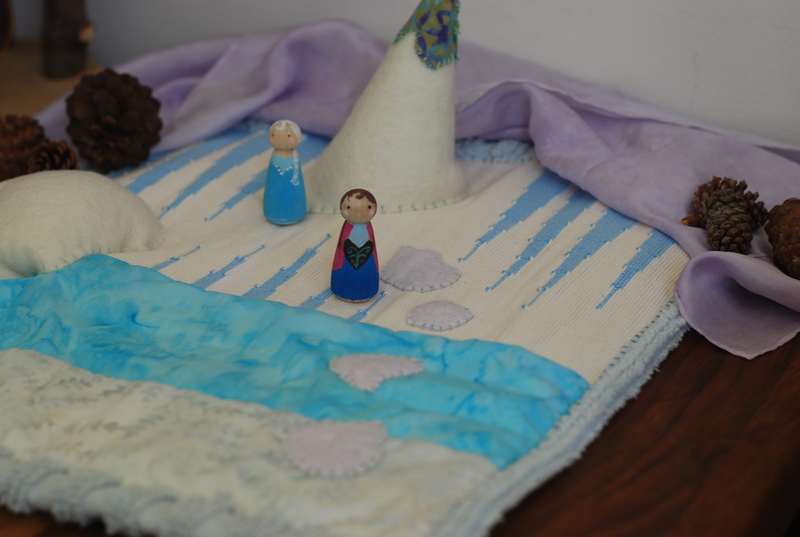 Here is another Frozen inspired mat with more batik cotton. 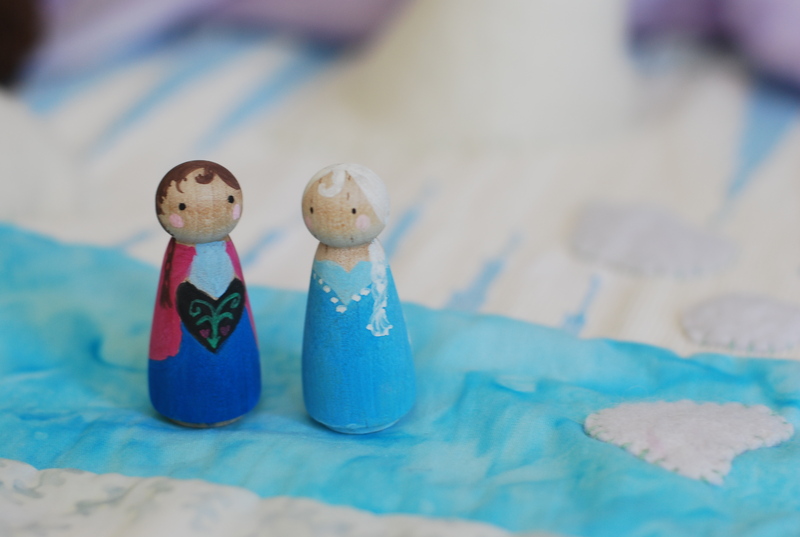 The “Frozen-inspired” mats won’t go in the store until next week because I’m still working on finishing up the peg dolls for them. 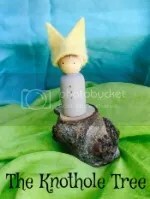 But, my store with also have some softie dolls and animals as well as some of my paintings. I’m nervous about putting myself out there like that but I really enjoy making these wonderful things! Check out my store, if you would like! And stay tuned next week for a giveaway from me to celebrate those 500 posts as well as the opening of my store! This entry was posted in making, Uncategorized and tagged creative outlets, my etsy store, playmats, Theknotholetree. Bookmark the permalink. 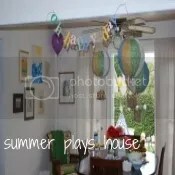 I LOVE, LOVE, LOVE that you are doing this, Summer! Go you! Thank you Yanic! The Frozen mats were so much fun to put together. Congratulations on your new shop! Such exciting news! I like that the peg dolls come with the Frozen mat. Congratulations!!! Very exciting for you. Good luck! I hadn’t seen frozen until 2 weeks ago. *ahem* I’ve watched it 3 times since and I keep breaking out in song. I think I’m 7 again. You go girl! The shop is neat. The name is clever. So far you’ve got some great stuff. 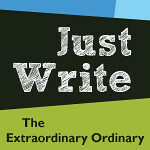 I know this will be a success and more and more you’ll be glad you decided to do it. Good for you. So proud of my oldest granddaughter and all the things you’ve accomplished and will accomplish. Yahoo! Makes me want to get well and get painting again. So excited for you! I’m checking out your store right now!